I made it to Mozilla Toronto’s Dev Derby Workshop on Saturday. Admittedly, I wasn’t quite sure what to expect. After all, this is an event put on by the people who make Firefox — a top-notch web browser used by over 450 million people. Fortunately, everyone in attendance and running the workshop was nice-as-could-be. Despite the Eventbrite invitation start time of 11:00, it actually got going a little after noon. The Mozilla office is a really inviting place — open, surrounded by cold drinks, and full of comfortable chairs and couches. It’s the perfect place for tech events, as it’d be difficult to not feel welcome there, which is certainly important for newcomers. Multi-Touch was the topic, as Mozillian Jen Fong got everyone going with very helpful examples of binding a canvas element to touchstart, touchmove, and touchend events. From there, she handed it over to fellow Mozillian Jon Buckley, who demonstrated pinch-to-zoom and rotation gestures on the iPhone. After the presentations, we ordered pizza and started hacking on whatever we felt like. I had never done anything with touch events before, but having the demos to get started made a huge difference. In about three hours, I was able to get a memory game together. 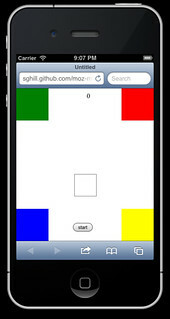 To play, you can head to http://sghill.github.com/moz-mt on your iPhone or Android browser. Begin by hitting the start button, and watch the center box carefully — it indicates the order you have to drag the center box to the colored boxes. There’s just one round with five turns, and it’s definitely not polished, but it’s pretty satisfying to get something together in an afternoon with technologies you’ve never used before. It certainly helps that Jen and Jon both hung around and were very willing to answer any questions participants had. Definitely looking forward to more events like this in the future. Thanks to Mozilla, Jen, Jon, and Kensie for putting this together!